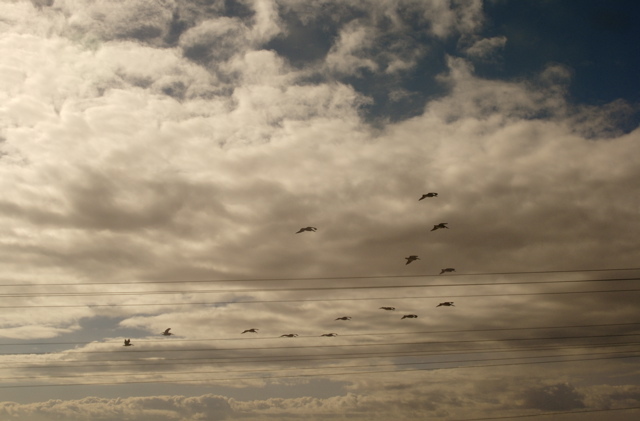 Click any photo below for a double-sized copy; Click BACK in your browser to return to this page. Steve Grande and Chris Guenzler on the Metrolink to LAUS where we boarded the Surfliner for Grover Beach. 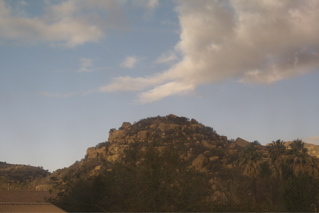 Chatsworth Hills where Roy, Gene, and Hoppy used to make films. The weather forecast was 30% chance of rain, but we didn't get a drop! 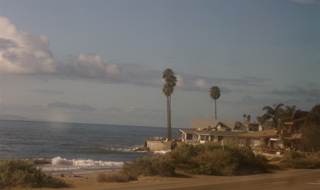 The first sight of the Pacific is past Ventura. Beyond the estuary is the Santa Barbara Channel and the Channel Islands on the horizon. 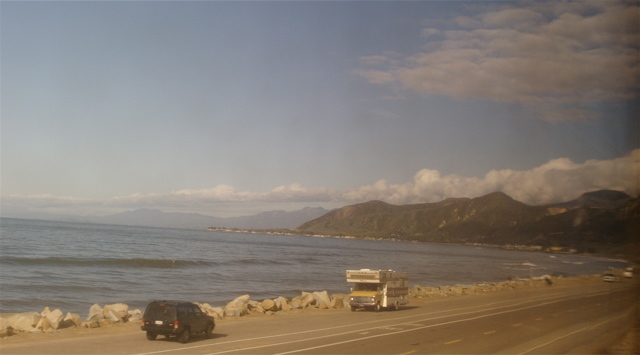 The lady sitting in front of me enjoyed the Pacific Coast view also. 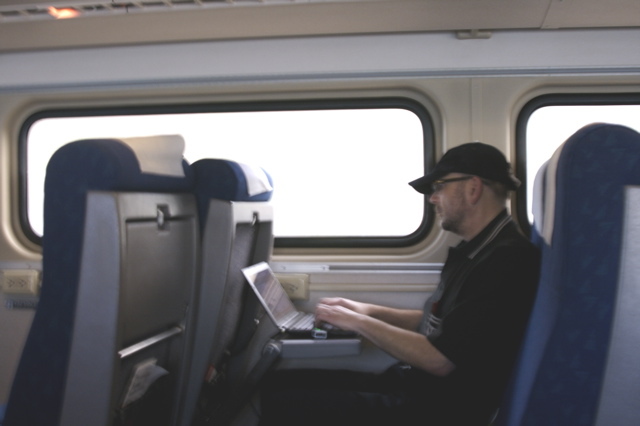 Steve does TrainWeb.com work even when he's on a train! Old Hwy. 101 parallels the tracks and is used for camper sites with ocean views nowadays. 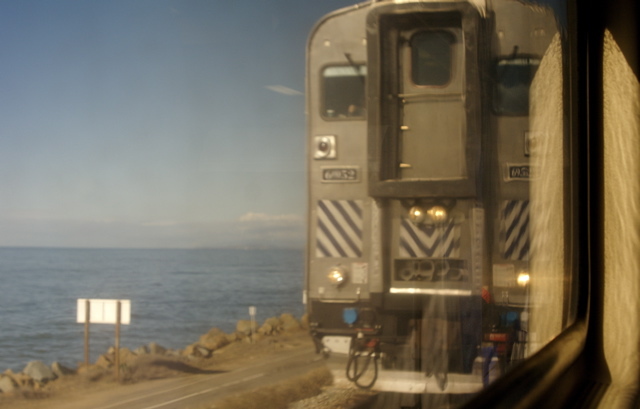 Southbound Surfliner cabcar meets our train. 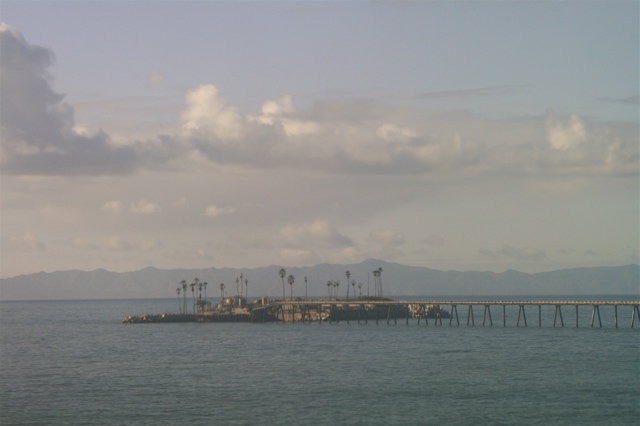 Oil pumping island disguised as palm tree island. Another oil rig with pipes to the mainland. 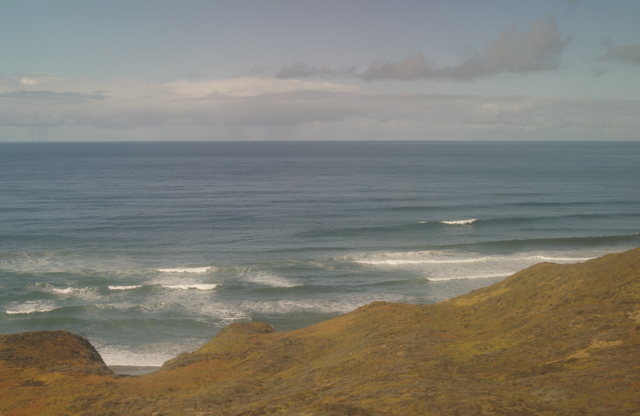 Pacific is right below us for miles. 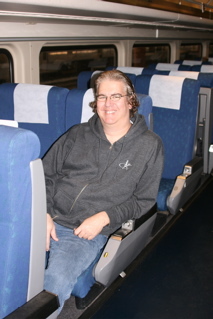 This gentleman, two rows in front of me, spent the whole ocean-view section of the trip in exactly this position...just like me. 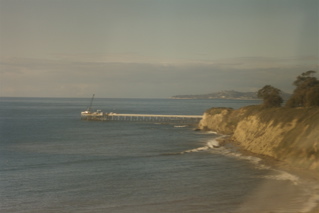 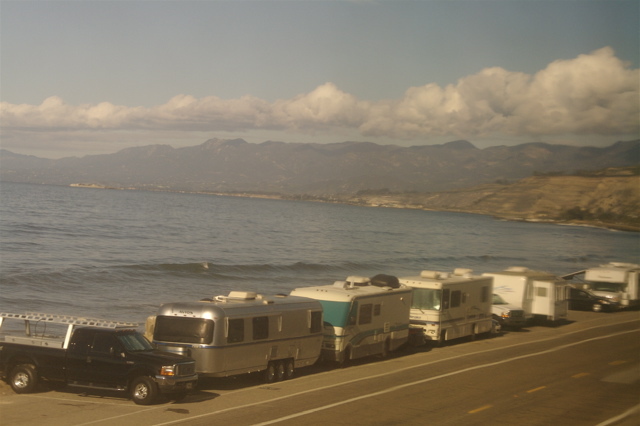 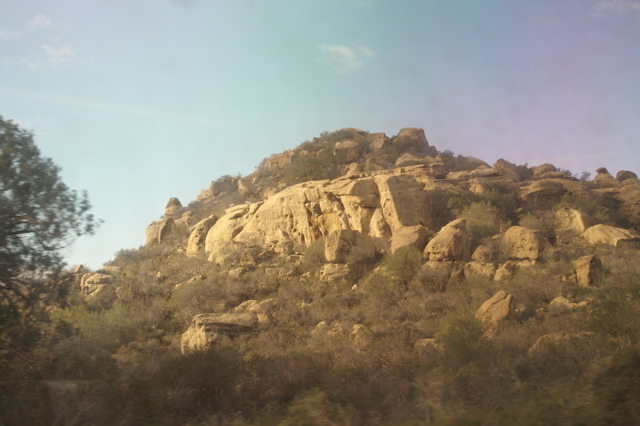 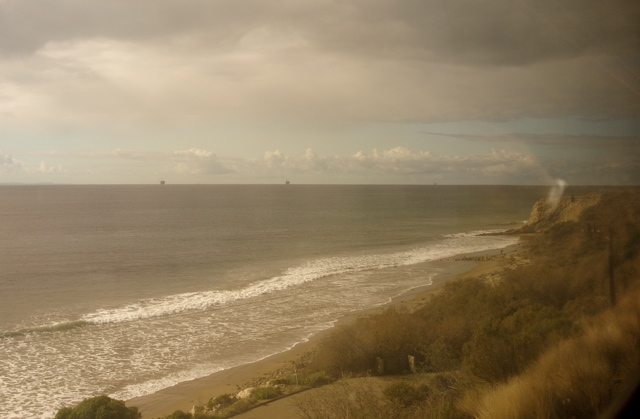 Our Surfliner in Grover Beach. 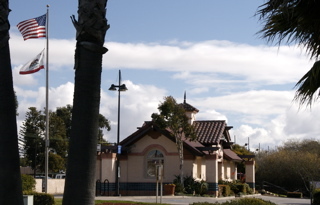 The Grover Beach 'Station,' a 3-sided shelter. 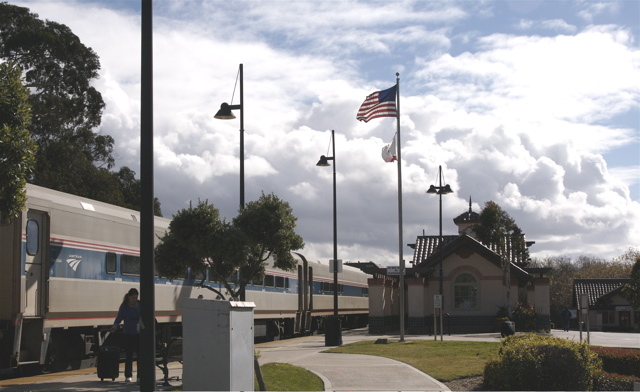 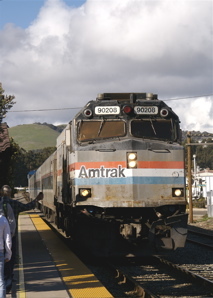 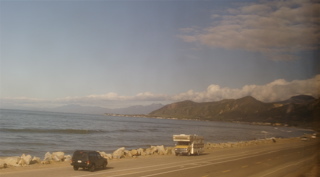 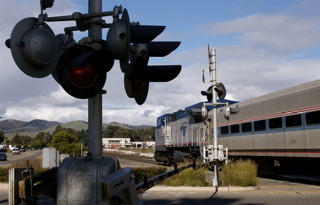 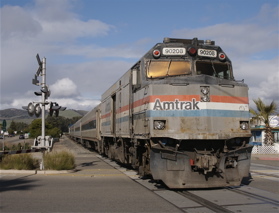 The 'cabbage' (cab car with baggage holding area) heads north from Grover Beach (red lights by number indicates that it is at the end of the train). 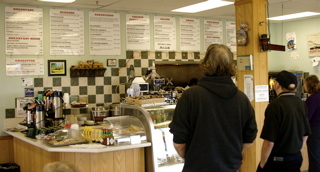 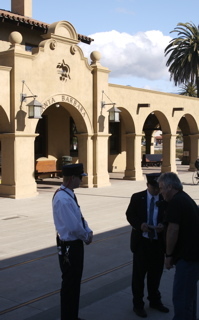 Ordering lunch at the Station Grill, across the tracks from the station in Grover Beach. We had nearly 2 hrs. for lunch and exploration in Grover Beach. 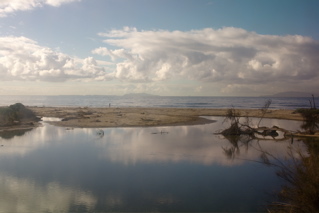 Steve and i walked to the beach. 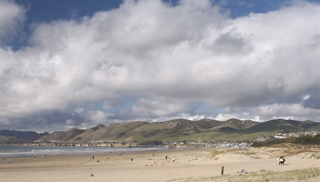 View north toward Pismo Beach. 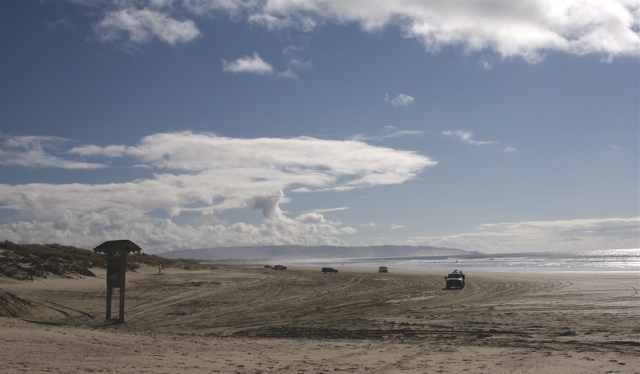 View south where vehicles are allowed to drive on the hard-packed sand during low tide. 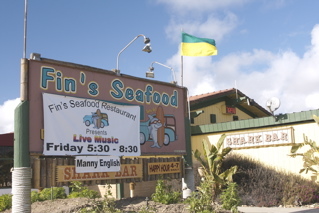 We might dine at Fin's Seafood on the beach next trip to Grover Beach. We returned to the station to await the southbound Surfliner, the same train returning to LA from San Luis Obispo. 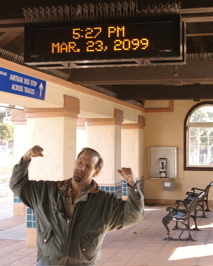 The trip had been sort of a time warp when we looked at the clock in the station. 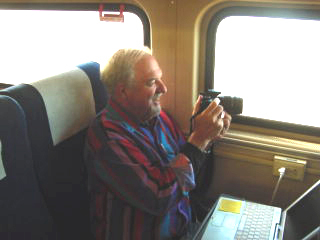 Larry thought he looked pretty good for the 81 years that had passed since we arrived. I guess you can't argue that the train was late! The Cabbage car lead the Surfliner back to LA, with headlights on this trip. 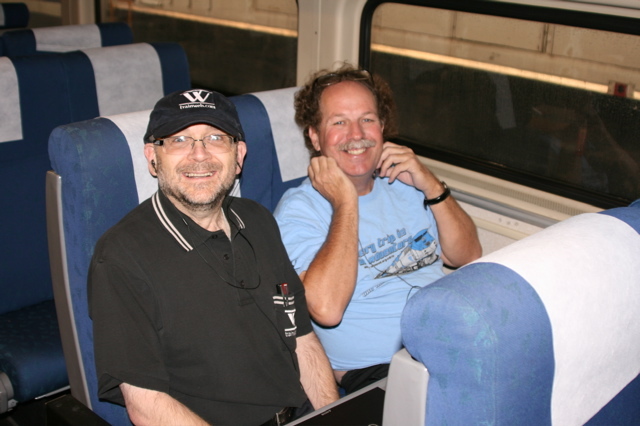 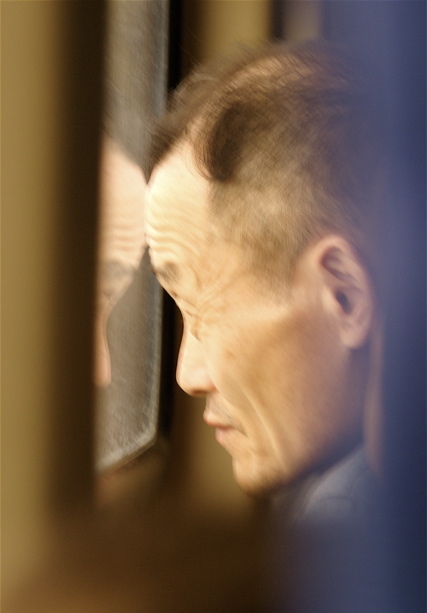 Join our Train Travel Meetup Group and enjoy our next outing and/or monthly dinners.